House Democrats on Wednesday rolled out an ambitious proposal to extend Medicare to all Americans, eliminate private insurance and drastically overhaul reimbursement for doctors and hospitals. Rep. Pramila Jayapal (D- Wash.) told reporters that the goal of the Medicare for All Act of 2019, which has more than 100 co-sponsors, is to completely overhaul the U.S. healthcare system and convert it to a government-run entity. 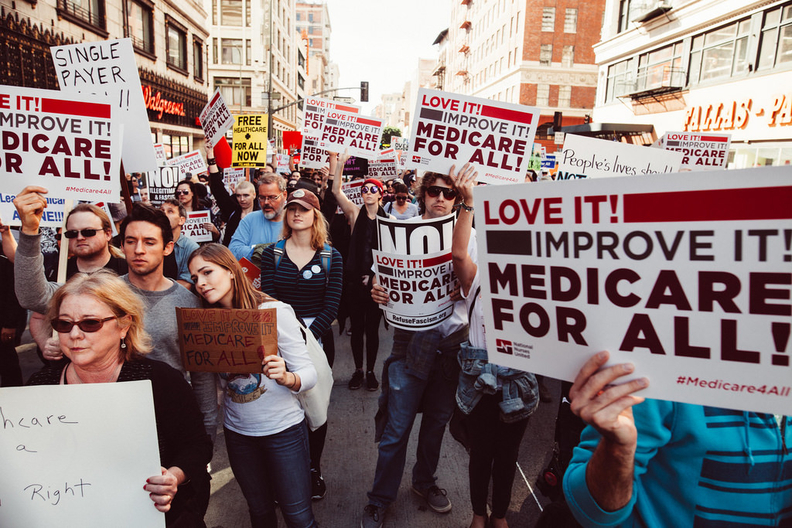 The legislation provides an outline of the thinking of some congressional Democrats on "Medicare for All," an issue that has been highly debated among Democrats running for president in 2020. "We believe that the market is broken and that is the core idea that we would like to fix," She said on a call with reporters Tuesday. "We love to buy our coffee from Starbucks…but there are some things that should not be provided through the for-profit marketplace and we believe healthcare is one of them." The legislation would expand Medicare to provide insurance coverage to every American and would ban private insurers from offering any benefits that duplicate the benefits covered by Medicare, likely eliminating most of the private insurance market. It would also drastically revamp how hospitals and doctors get reimbursed by Medicare. Each hospital would get an annual prepaid budget to cover all healthcare costs for the facility for the given year. HHS would appoint regional directors that would oversee all hospitals and doctor offices in a specific region. The director and the hospital would negotiate the budget. Nursing homes, health centers, home health agencies and independent dialysis facilities would also get an annual budget. The budget would be determined by a host of factors that include the historical volume of services the hospital provided in the area, Jayapal told reporters. "It is a common practice of most of the developed countries around the world and it has been very successful," she said of global budgets. "It increases accountability over hospital spending." The annual budget could also be changed if there are certain circumstances, Jayapal said. Doctor offices would still be paid under a fee-for-service model, however some physicians included in certain group practices can opt to get a salary from a hospital or another provider that gets a global budget. Jayapal expects that around one to two million people would be out of work if the legislation becomes law because of the elimination of most private insurance. She said that 1% of the global budget for hospitals will go to a fund to provide services to displaced workers in the insurance industry. "This could include pension benefits, include any number of things that would take care of these workers as we transition," Jayapal said. "I do think there will be a boon to the economy once we get healthcare under control." Jayapal added that a private insurance industry could still exist, but they couldn't cover the same benefits as Medicare, which include coverage of prescription drugs, hospital and physician services and long-term care services. However, an insurers could cover services such as cosmetic surgery or other types of elective benefits. Healthcare sector lobbyists are expected to put up a vigorous fight against any "Medicare for All" proposal. America's Health Insurance Plans, the top lobbying group for the insurance industry, issued a pre-emptive strike on Tuesday in anticipation of the bill's introduction. "The vast majority of Americans are satisfied with the coverage they have today," the group said in a statement. "They have choice and control over their coverage, options, and treatment." Jayapal said that money from industry groups would be the biggest obstacle to getting the bill through Congress. But it's unclear whether the bill will come up for a vote in the Democratic controlled House. Jayapal said that the legislation will first get a hearing in the House Rules Committee and in the House Budget Committee. The bill has been referred to the House Energy & Commerce Committee and Ways & Means Committee, which both have healthcare jurisdiction. So far no hearing has been scheduled.